It's Mobile World Congress, where handset manufacturers announce phones they won't ship for months. HTC will do a little better, offering the new HTC One family of smartphones starting in April. Flagship handset One X is loaded for bear, with 1.5GHz quad-core Nvidia Tegra 3 processor and 4.7-inch 720p display. Is it me, or does the One X look a little like a beautified HTC Titan II but running Android, packing more cores and offering higher-res display? 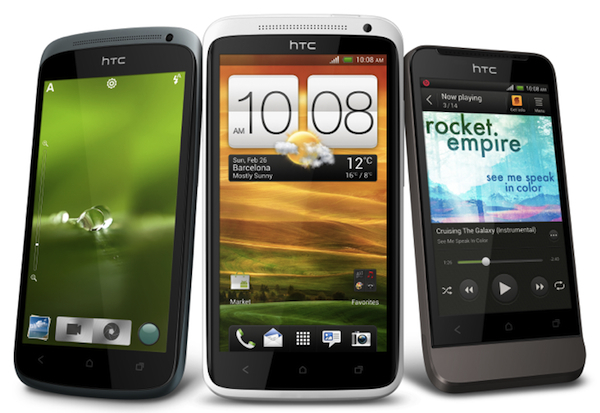 Or perhaps these HTC phones all kind of look the same. Whatever, the One family (pictured), particularly the X, looks lots like HTC trying to regain some of its Android mojo. If you're willing to wait those aforementioned months, AT&T will carry HTC One X minus two cores but with 4G LTE -- that's a 1.5GHz Qualcomm Snapdragon S4 processor for you, bud. Hell, so much for that quad-core goodness. Other features: Super LCD 2 non-PenTile display, 32GB storage, 1GB DDR2 SDRAM, 8-megapixel f/2 rear-facing camera, 1080p video capture, Beats By Dr. Dre Audio, HSPA+ (up to 21Mbps), Sense 4 UI, Dropbox integration via Sense, 1800 mAh non-removable battery and, of course, Ice Cream Sandwich. "The best moments in life are captured with a photo or remembered by a song, so it was key for the HTC One series to improve these emotional experiences with an amazing camera and authentic sound experience", Peter Chou, HTC CEO, says. "We are very focused on creating a camera and audio experience customers will love and use often and we believe the HTC One series delivers this in a way never seen on a phone before". Seeing is believing, and I haven't seen yet. Along with the flagship phone, HTC announced the smaller One S, which shares same camera and audio benefits, Dropbox integration and also Sense 4 and Android 4. T-Mobile USA already announced plans to carry the phone. Other specs: 4.3-inch qHD Super AMOLED display (with 960 by 540 resolution), 1.5GHz dual-core Qualcomm Snapdragon processor, 16GB storage, HSPA+ (up to 42Mbps) and 1650 mAh non-removable battery. Finally, there is the One V, which design borrows from the HTC Legend. The One V is low-end and, for right now, sans carrier. The smartphone has 3.7-inch display (with 800 x 480 resolution), 1GHz single-core processor, 512MB RAM, 5-megapixel rear-facing camera, 1500 mAh battery, Dropbox integration, Sense 4 UI and Ice Cream Sandwich.